I have been in Canada for four weeks now, and it’s been awesome! The weather is warm, but definitely not as muggy as the ‘Sip.' Canada is very “green.” In saying that, I mean they value the environment and recycling. 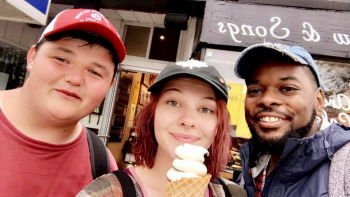 The culture here is described as a “salad bowl,” unlike the USA being a “melting pot.” In Canada, the people bring their lifestyles here and just mix in with the existing culture. It’s really beautiful. We are staying in the city of Mississauga, outside of Toronto, but still in the Greater Toronto Area. Upon arrival, we did a scavenger hunt in attempts of exploring the city. (Our team won!) Mississauga is broken down into three different neighborhoods: City Centre, Cooksville, and Port Credit. City Centre is the largest in terms of population. Its skyline is decorated with high-rises, and every hour of every day the streets are flooded with people. Cooksville is known as an immigration hub. It’s a very diverse neighborhood with ethnic food markets, shopping centers, and barbershops on every corner. Port Credit is a place of art and peace. It’s right on the water (Lake Ontario). Smooth Jazz or Classic Rock N’ Roll can almost always be heard traveling through the streets. After the scavenger hunt, we spent a couple days prayer walking all three neighborhoods. Early on, God opened my eyes to Cooksville. It instantly stood out to me. Not necessarily as a place I wanted to be, but a place I felt God was leading me to serve in this summer. Cooksville didn’t feel comfortable. It was filled with boisterous car horns and unfamiliar languages. I would have felt at home in Port Credit, but that’s not where God wanted me. I knew going into this summer, God wanted to take me out of my comfort zone, so I could grow. God placed an introvert into a city where I had to quickly become an extrovert. I have learned a lot these past few weeks and will continue to learn even more during the remainder of my time here. Being placed in a city where only 10% are evangelical Christians is very hard. Following God and loving His people, created in His image, is not always an easy thing to do. But I’m going to do it, because having knowledge of a God who sent His only Son, Jesus, to die for everyone from all nations, and who conquered death so that we do not have to spend eternity separated from God, is something I have to share. The challenge comes with the “how.” That’s where more learning takes place. We as a team have to learn how to contextualize the Gospel. Sharing the Gospel with people who have no idea what you are talking about is a challenge. You CAN’T use church words, because they have no idea what you are talking about. So, how can you show them the Gospel? By being intentional. You have to build relationships with people. That’s what Christ wants us to do. We have met many people and a few persons of peace as well. We have also linked up with an organization called D.A.M. (Develop, Assist, Mentor), a Christian organization that works with the youth in the area, building relationships with them and opening doors to share the Gospel. It’s an amazing place! I know God is going to do something great in Cooksville this summer. I’m so grateful he has placed me here to witness it. I ask, if you would, pray for Mississauga and all of us serving here. Eh?